After all it was a great big world. The world is big and my dreams are vast, my wanderlust continues to grow. Meanwhile, my travel the world fund doesn't seem to thrive in the same manner. So for now I'm just a passionate dreamer with big aspirations. I've always felt destined for greatness, like an infallible path towards a certain life. A beautiful life. I also always feel like society puts a lot of pressure on everyone, but on women in particular in many aspects. I don't feel a woman needs to choose between the path of love and a family or a career, with drive and passion we can have it all, or if we're not careful: nothing at all. I want it all. I dream of being a top costumer/stylist or an art director for a great firm, company or be the stylist who caters solely to a ring of A-listers or the real crème de la crème while still spending the rest of my life with the man I can't live without. I want to see the world and make it more beautiful, just one smile at a time. Not everyone can see beauty in everything and I feel its a talent I want to share. But love is undeniable and infallible. I have found the love of my life and I know my path. That is more than a lot of people can say and for that I am extremely grateful. I know who I am, what I want in my life, and who I want to spend my forever with. The road is long, but the journey promises adventure. I found out my boyfriend asked my father for permission to ask my hand in marriage this summer. I guess its safe to say, ish has gotten real. This is super serial serious. I used to never be one of those girls who always knew they were going to get married, in all honesty I used to be against it. I used to feel this way because I thought that most people do it for the wrong reasons. Everyday people marry for money, status, or because it's what they are supposed to do, rather than for the right reasons. You should only marry someone because you can't imagine a world without that person, or because a night alone in a bed with out them seems like Alaska with a wet blanket, or simply because you are both better people together. I know that when I do finally get hitched, at least I'd do it for the right reasons. So what if we have a five-year engagement, we will get married as young, cultured, successful professionals with great careers and a few years to enjoy DINK-dom (Double Income No Kids) and all the enjoyment of each other as newlyweds who are financially stable. So for now, I'll keep it casual, keep it cool- its what I know best. I've been super dreamy lately and between hair cuts, so the hippy band is my new best friend. I felt like this look had a lot going on, but was still super casual and I liked that. It makes it a little different and unconventional. So sweet! Thanks so much. But I can see me on GFC: Second row, no.3 from the left ;) Hope, you finde me, too. keep dreaming, you're doing great! and you will succeed!! Thanks Eli! I love a good animal print accent. It always makes a basic outfit more fun and pulled together. I really like your sandals!! lovely look dear :) thank you so much for stopping by on my blog and for the wonderful comment! i'm following you back now :) keep in touch! Hey there, loved your blog, just followed you on GFC, (219) would you mind to follow back? 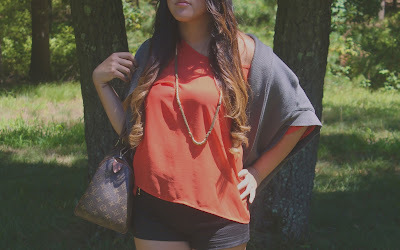 Great look, so carefree and stylish and the orange looks great on you! Thank you so much for your sweet and thoughtful comments, they really made my day! I am happy that I was able to inspire you, and I would love to see some of your artwork!! PS. Following back with Bloglovin' and GFC. I love this, you're so beautiful! Ahhh, so sweet! Thank you! Oh dear, love this leo shoes!! ADORABLE!! Super beautiful look dear! Great pictures! Wish you a rocking weekend! Love your outfit! It's inspired! Wonderful write up! Changing the world one smile at a time. Love your outfit doll. Would you like to follow each other on Facebook, Bloglovin', GFC, and/or Instagram. Please let me know if you're interested. I'm following with great pleasure! Lovely look darling. I'm following you now on Bloglovin. Please follow back. Would you love to follow each other on other platforms?